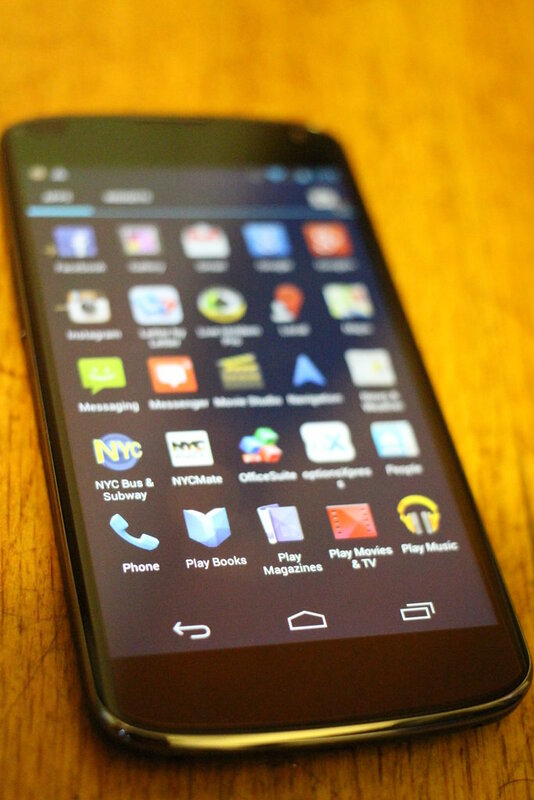 In early November, Google announced their latest Nexus phone, simply called the Nexus 4. The device is built by LG and packs high-end specs along with a price tag that is unbeatable. Google decided to skip the carriers with the new device, instead selling it through their own Google Play Store starting at $299. Unfortunately, the company was met with launch day hangups that caused the Play Store to crash and for a small number of would-be buyers to actually be able to purchase the device. In early December, the company began offering another lot of their inventory, and was once again met with server crashes and errors. However, many more people were able to purchase, with shipping times of 4 weeks, or more. Those devices are being received by Google fans, now. Despite being an excellent vanilla Android phone (especially at the price), there are some downsides. Let's get into the review. 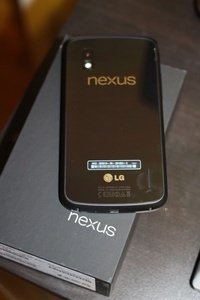 The Nexus 4 features much improved specs over the excellent Galaxy Nexus. The processor powering the phone is a 1.5GHz Qualcomm S4 Pro. The processor alone makes the device one of the fastest yet released, but being tweaked and running on a vanilla version of Android with no horrible third-party UI means the device really flies. Even after downloading all apps, it was easily the fastest phone I've ever used. Additionally, the device has 2GB of RAM, 8 or 16GB of internal storage (no microSD slot), and a large 2100 mAh non-removable battery. As is standard, there is 802.11 b/g/n Wi-Fi, Bluetooth 4.0 and NFC. Unfortunately, and while it is not a complaint for me, there is no LTE support for the Nexus 4, despite there being a dormant LTE chip inside that works on certain bands. The lack of LTE will be a huge deterrent for most, but living in NYC and having T-Mobile I fortunately had no complaints with my data speeds. It does seem inexcusable for Google to not add LTE support when even Apple has it now, especially in the U.S. where AT&T and T-Mobile will fully roll out their LTE networks next year, but Google says their decision was mainly battery life related. 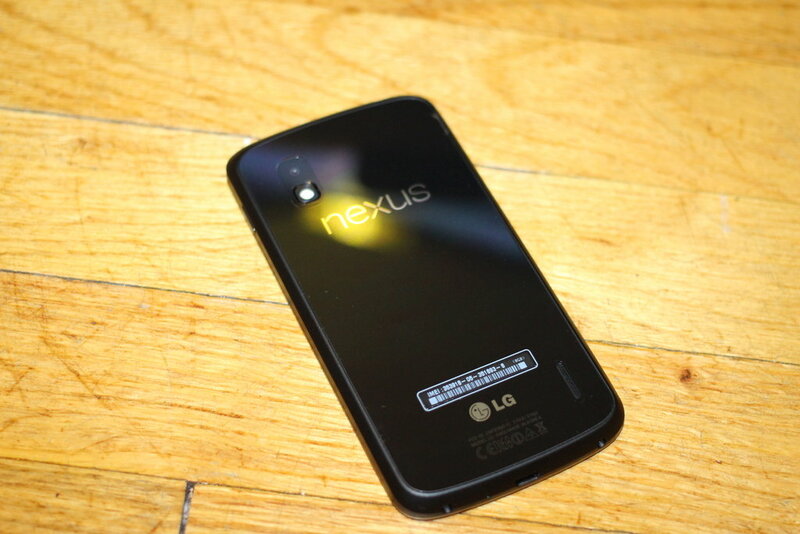 On the design side, the phone is a hybrid of the LG Optimus G and the Galaxy Nexus and it is a very elegant look. The phone is sleek black with silver trim and a glass back. The back is non-removable but does feature scratch resistant glass. I have not had issues with it yet, but I would certainly recommend some kind of cover or sleeve for the device because that back cover will absolutely crack if it's dropped from high enough. The device is about as light as the Galaxy Nexus but has a full body design that is evenly weighted all around, unlike the Galaxy Nexus, which has a thicker bottom and a very thin top. Part of that silver trim is also tapered edges, making the phone very comfortable to hold. The device feels expensive. There is very little on the device itself except for a small speaker grill on the front and back, two cameras, a power button, volume rocker and a micro-SIM slot on the side (since the back cover cannot be removed). Overall, a very elegant package. LG has placed a fantastic display on the Nexus 4. 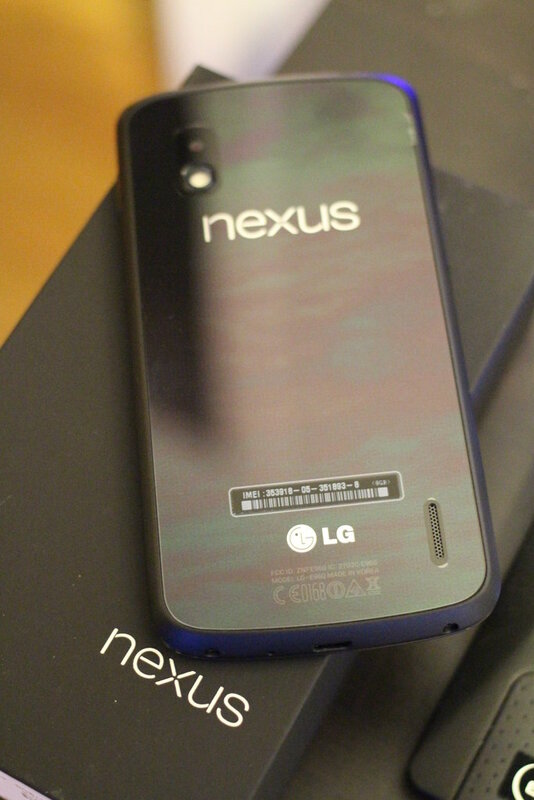 The Nexus 4 features a 4.7-inch True HD IPS PLUS with 1,280 x 768 resolution and 320ppi, a large upgrade, in my opinion, from the Pentile-packed Super AMOLED of its predecessor. Everything looks crisp, and color reproduction is strong, as is contrast. The company also used a new technology to integrate the screen's touch sensor into the outer layer of the glass, making the pixels closer to the actual display. This is the same tech we have seen in the new iPhone 5. Corning Gorilla Glass 2 is also standard, protecting the phone from scratches and cracks. Although it was never much of an issue with the Galaxy Nexus, the 4 did provide me the least "sunny day" glare. 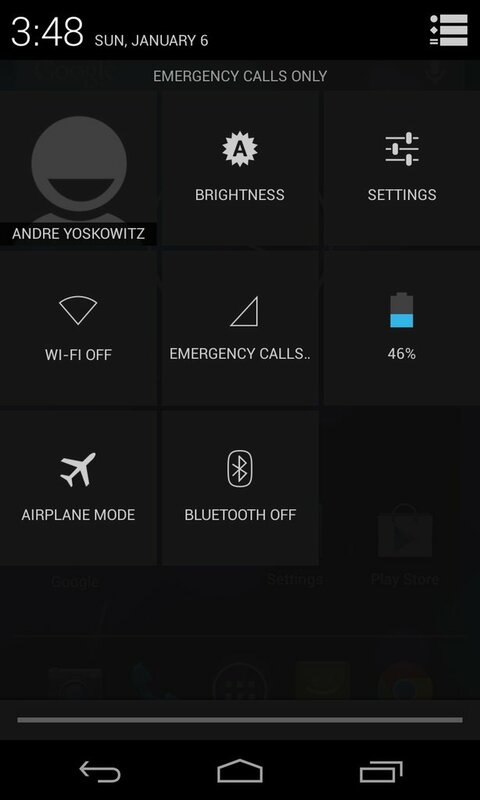 Brightness did not need to be turned up to 100 percent to be able to read on a normal day with sun. Viewing angles are fantastic, as well. Overall, a very pleasant experience. As stated before, the performance on this phone is blistering. The new Jelly Bean (Android 4.2) is Google's most efficient operating system and matched with high-end hardware, it's a great combo. 80 apps installed later and there was zero lag, whether on app opening or just flicking through multiple screens with multiple apps open. It was almost somewhat strange to not feel the minor lag I've been experiencing with the Galaxy Nexus. It was also a relief. I found the device to be much faster than other devices with quad-core processors, likely because it was not hindered by a third-party UI like Samsung's TouchWiz or HTC's Sense. Battery life was also very solid, on par with that of the Galaxy Nexus, although neither has spectacular battery life. With moderately heavy use, battery life clocked in around 13-15 hours. 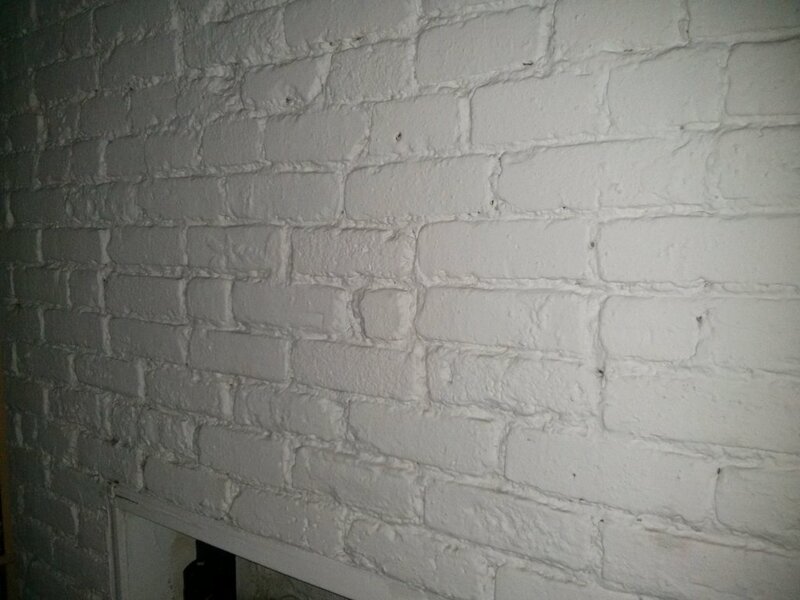 With light use, 18-20 hours was completely accessible. 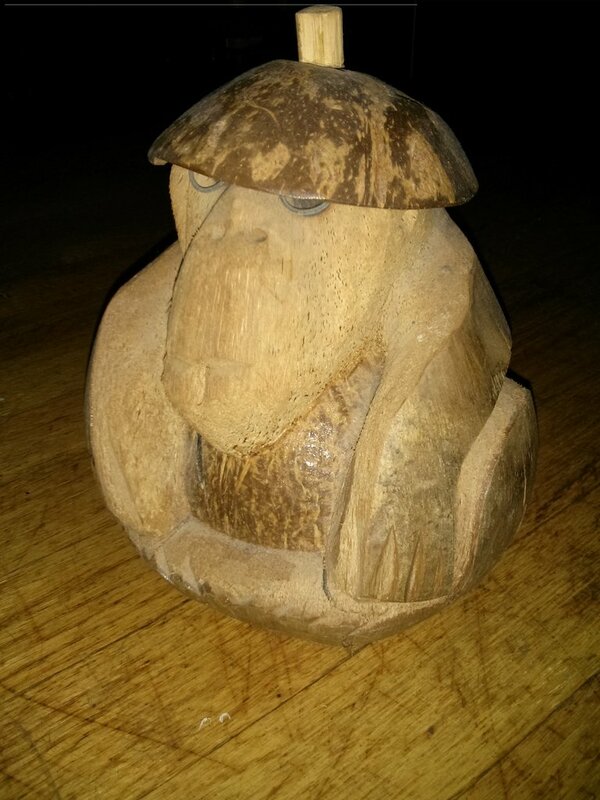 The camera is a massive improvement over the small megapixel-ed Galaxy Nexus. Google completely revamped the camera software, as well, adding new features and a minimalistic interface (at first glance). Samsung featured an outdated 5MP camera in the Galaxy Nexus but LG was quick to add the standard 8MP. Of course, megapixels aren't everything but there is certainly a difference between the two. When going into camera mode for the first time, there is little else but a viewfinder, a toggle for camera/video/panoramic modes, the shutter button and settings. 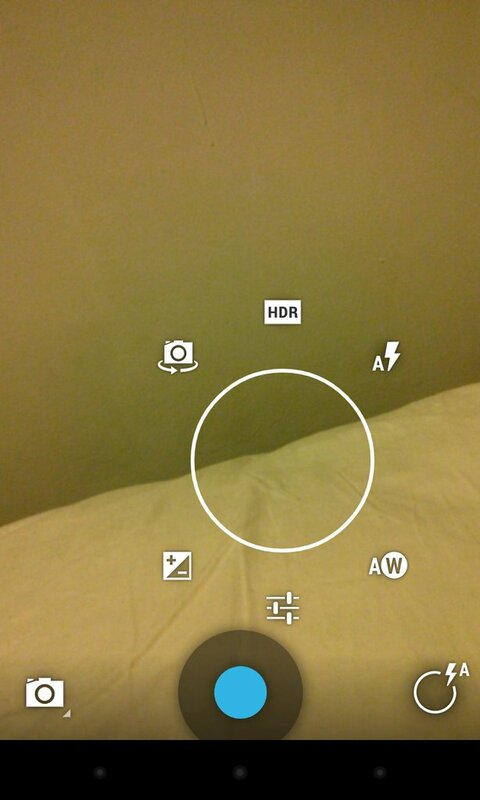 If you press the viewfinder, however, a circle will show up in the middle of the screen. 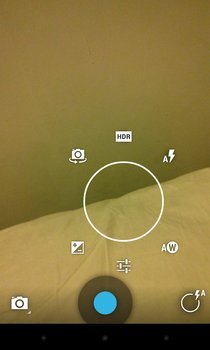 You can gesture drag from this circle to be greeted by many new options, including native HDR, white balance, scene modes and flash. The gallery preview has disappeared, as well, and been replaced with a gesture. Swipe to the left from the right side and the "Filmstrip" gallery view appears. Very nice addition. 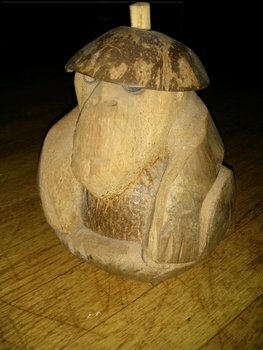 Images were crisp, as were colors and low-light quality (below) but the camera did not live up to the industry standard (the iPhone). Shutter speed was slow in many cases and the exposure and settings can take some getting used to. As with any other Nexus device, you are paying for the Google experience and that is most likely the reason you are buying the device. The Nexus 4 does not disappoint. As stated, Jelly Bean 4.2 is the most innovative, fastest and visually appealing version of Android yet, and it is isn't really even close. While iOS has (let's face it) flat-lined over the past couple of years in terms of aesthetics and software innovation, Google has continued to improve. If it were not for serious fragmentation issues, Android would have an even bigger lead in the smartphone market. The features of Android 4.2 have been explained in depth across Afterdawn over the last couple of months so I will keep it brief here. 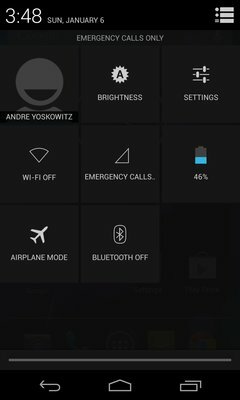 The main new addition to the notifications screen is a new grid that includes your profile and quick links to settings, brightness, battery life, Wi-Fi, etc. In the camera, there is "Photo Sphere," a new vertical panorama setting along with a much improved standard panorama mode. Finally, there is widget locking for the lock screen, giving you access to your most used streaming apps (stocks, Twitter, Facebook) without having to unlock the device. Additionally, you can reach the camera this way by swiping right from the lock screen. Both are very handy features. Google's ecosystem is as good as it gets, and is at this point almost on par with Apple. Where Apple still excels is its music and movies integration. Google has tight integration of both, but the libraries are not there yet. The Play Store recently surpassed the iOS App Store for app count (not that it matters) and revenues are flying as developers see the potential gold mine. 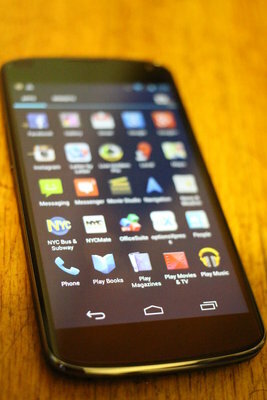 The Google Nexus 4 is a sleek, strong smartphone built with high-end hardware and a high-end operating system. It features a fantastic display, and performance is zippy. LTE is notably missing, but fortunately for me this was not a problem. I could absolutely see where it would be a dealbreaker in many other instances, however. Storage can also be an issue, but this is all part of Google's master plan to have all your info in the cloud. At $300 off-contract, the price cannot be beat, especially since Apple and Samsung charge above $600 for their flagships unlocked. Google has a winner here, and easily the best Android phone I have used. Now if they could just get their supply chain right. ¿How can performance be 10 out of 10 and hardware 8 out of 10? ¿Just because there is "better hardware outthere? I mean if the hardware gives you a 10 in preformance ¿shouldnt it be 10 in hardware? You are right. I'd also include a fixed battery and a glass back cover as hardware negative points. Almost every phone maker is copying the iPhone with this, but it doesn't make it a nice practice (I'd say quite the opposite). The camera is also a piece of hardware, and there are far better ones out there. Besides all that, neither better hardware does always imply better performance, because a different version of the OS may also affect it drastically, nor better performance would necessarily mean better hardware, since the best performance can be achieved by shortening the life of the processor, for instance, by overclocking it. So, durability is also an important factor for measuring hardware quality, but not for performance. Both hardware and software will affect performance, and this device runs a "vanilla" version of Android, which also will boost responsiveness (and speed in general) up, without having to improve any physical components. "You know, it seems that quotes on the internet are becoming less and less reliable." -Abraham Lincoln. you can't increase the memory of any phone. The storage size is fine since you can store on the cloud for free. This phone for the price is awesome. $300 out of contract is outrageously awesome. If it could work on sprint I would score one asap. Aside from pulling a battery after a freeze when have you ever had to open the back of your phone. The camera could be better, but it doesn't need to be. What phone comes close to this one? I would say the DNA and the Note 2 are direct competitors with this phone. And I have the Galaxy S3 and while it is only dual core, it is keeping me happy enough to not be avidly looking for the next best thing as usual. Not even close the same price tag. Comparing Specs:Price, the Nexus 4 is THE top android phone in the world. There is no competition to this hardware in this price tag. Not even Windows phones. And, of course, Apple can't be considered (in fact, this phone beats the iPhone 5 at half the price, IMHO). Yes, definitely. I don't consider Windows phones as competitors against Android. And I already gave up on Apple years ago. I disagree... Partially. As for now, Nokia Lumia 920 is probably the best smartphone ever made. But... It's also very expensive, so out of the competition as well. Expensive is a decriptor for price, not "feel."